barmer is a beautiful desert city which is located at a distance of about 157 kilometers from Jaisalmer , 485 km from Bikaner , 222 km from Jodhpur and 588 km from Jaipur and is easily accessible from these cities. barmer is tiny yet lively town in desert drenched sands, barmer is a miniature Rajasthan with all its colour, warmth and tradition. Every year in March the desert town is at its colourfull best during the exuberant barmer festival. 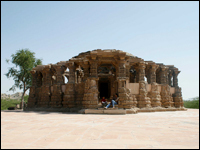 The festival is the best time to plan a visit to barmer. barmer was a beehive of activity till a few centuries ago, and a number of important kingdoms flourished at various times in the district during the medieval age. The chief principalities of barmer at the time were Khed, Kiradu, Pachpadra, Jasol, Tilwara, Sheo, Balotara and Mallani. It was the Panwara clan which had strong links with the Solanki dynasty of Gujarat, whose sphere of influence extended right across the barmer region at the time. Later they wrested Mandore, which was the former capital of Jodhpur and held it for a while. Meanwhile, Khed and Mallani districts were captured by the Guhil Rajputs who were ruling over Mewar at the time.